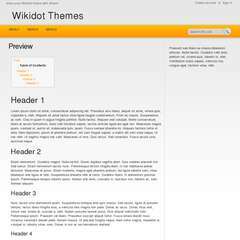 The Freshly Squeezed themes, now arriving at Wikidot, are designed to be simple and flexible. Available in a range of colours, these themes are sure to suit all of your needs. The theme is a fixed width of 960px, and the sidebar can be position on the left, right or not displayed at all, to maximise the screen real estate. It also includes customised buttons, comments and a 'masthead' infobox to really capture your visitors attention. For a live preview customised to show off the best of the Freshly Squeezed theme, including the masthead infobox, I recommend you head over here. Freshly Squeezed Theme - Orange Variation. Grab the attention of your visitors with this visually appealing masthead infobox. All you have to do is create a div with the class masthead, and then add one line of CSS in a CSS module. You may need to adjust the value of padding-top, depending on how high your masthead is. + Type you tagline, slogan or something else in here.